* lightly trace 3 concentric circles on the grungepaper, with a pencil. *make a tiny slit & start tearing the grungepaper, following the circle outline...remember...art doesn't have to be perfect! *the middle size with brushed corduroy. * stamp the stem & the leaves on grungepaper scraps using the jet black archival, then ink the front & back with peeled paint, using the blending tool. * using jet black archival, stamp the leaves with the screen stamp and the back of the stem with the screen stamp also. 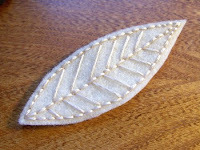 * glue the stem to the back of the flower & glue the leaves in place. * the snap is the finishing touch! That's what I'm calling this technique, because Ranger's Perfect Pearls are the key ingredient. This is a take off of tim's "wrinkle free distress" technique. One of the MANY I got to learn @ Ranger U.
I couldn't wait to see if it would work. 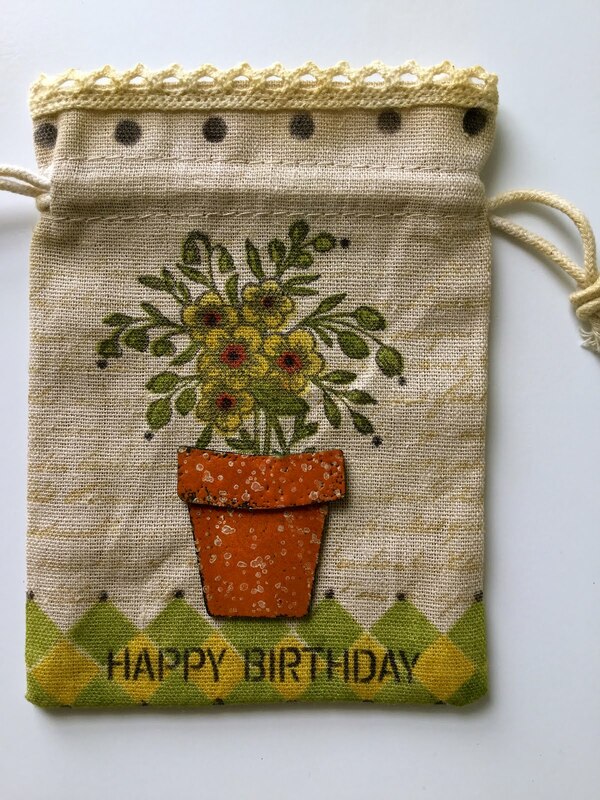 * Working on the craft sheet, ink the entire tag using faded jeans distress ink & the blending tool. Always work from the craft sheet, onto the tag in a circular motion to get perfectly blended backgrounds. *Take an empty Mini Mister, dip the tip of a craft stick into the sunflower sparkle Perfect Pearls to pick up a small amount of powder. *Drop the PP into the Mini Mister & add water up the last “R” in Ranger. Shake to mix. Now you have a shimmer mist. *Swipe the walnut distress ink pad and the black soot pad onto the craft sheet & mist with enough Perfect Pearls/water mixture to create beads of ink. * Using the background stamp, stamp into the mixture & then stamp onto the tag. Repeat until the tag is covered with the background stamp. *Dry with the heat it tool. * Here's the result...you may want to click for a larger photo. I had a hard time getting a decent photo, because of the shimmer. 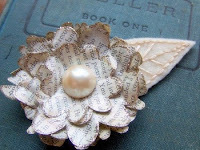 * I hope you can see that the Perfect Pearls are only where the stamping is. So, instead of misting the whole tag with Perfect Pearls, you can control exactly where the pearls are placed. *Another plus...once mixed with water, Perfect Pearls are set...no special fixative is needed & you won't be "wearing" glitter! *I'm off to add an edge with the gold paint dabber...and then maybe a...??? Where can the elusive grungePAPER be found??? When are the Fillable alcohol ink pens shipping??? Who has the Memory Capsules in stock??? quick shipping...I WANT my stuff IMMEDIATELY! 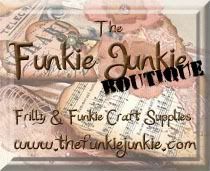 They give eclectic goodies with orders over $40.00! ... they are NICE gals too! they will have ALL my studio 490 stamps in stock!! I LOVE to help people SHOP! but they'll get over it when they see how happy you are!...ha! Grab some quick...it flies out the door as soon as it arrives everywhere! you won't want to run out! Happy Memorial weekend from Rick & I to all of you! we really DO live in the middle of nowhere!! I hope I'm out of town that day! We got these @ Costco...$129.00 ea. The web site listed on the box is here. maybe they are made specifically for Costco?? If I'm not making art...I'm quite happy to organize! I was in a hurry to leave...Sorry about that!! (I'll have photos, as soon as they are assembled!) They're cute! And maybe a quick stop @ an antique mall??? I'm outta here...I moved like the place was on fire! Here's the scoop about filling the alcohol pens, right from tim. try the pens...you'll have fun! perfect for a class or 2 or 50! This was my best find!! I'm planning a bedroom redo too...but that's still a secret! See the spot in the middle??? How can we get this guy out of here?????????? And we saw him again early this morning...horrors!! Tell me if you do!!! What could I do with them that's a little different??? Cool storage is another thing I LOVE! or if you're like me...GET THEM ALL! oops...sepia too...make that 4 basics! 1. stamp the screen stamp on the kraft cardstock with the coffee ink. 6. Using the fillable pen...ink the leaves with any green alcohol ink & use another pen (filled with a blue alcohol ink) to color the flowers. 7. assemble the flower...insert the brad into the washer, small flower, large flower, leaves, game spinner & thru the ring on the memory frame. Spread the prongs to hold in place. Glue the memory frame onto the black presentation board & glue that to the background & insert into the big frame. and a row of rhinestones on top of the memory glass. $$$ later (the first number is a 3!)...YIKES! I found LOTS of cool fun stuff! See those mini Jenni Bowlin papers? God forbid I ever run out! PERFECT...less rushing early on Saturday. The classes were great fun, if I do say so myself! Lots of new friends...and I got to see some Scrap St. Louis friends again. COOL! you get the idea...they SHOPPED too! They liked studio 490 stamps...lots found new homes. Dana has a special order to call in today! GREAT store...GREAT students & GREAT shopping! See that old metal toilet paper holder?? so mum is the word until they get them! 8 year old Emily, from Iowa. We have become friends & today is her birthday! HAPPY BIRTHDAY to 9 year old EMILY!! Emily..I hope your day is PERFECT! I even got invited to her birthday party, which was on Saturday. but that I would send her a box of goodies. Her reply was that she would like something"homemade". it's much cuter than the label shows! Enjoy Emily...I'll be waiting to see what you create! The Stamping Place in Columbia SC! Barbara just added on to her store & we'll be playing in a brand new classroom. It sounds AWESOME! We have 4 fun classes scheduled...the "Build A Better Bird" is one! we girls gotta have some secrets! thanks! COOL...that NEVER entered my little mind. I LOVE the colors & the entire piece. THANKS Lisa & Nancy...GREAT work. You made my stamps look good! I'm PATIENTLY (NOT) waiting for the release of Lisa's book. I'm betting you might see some glitter used...just my guess! I like them...but mum is the word, until we get closer to CHA. Caroline (MS Maya Road) tells us when it's OK to start the peeks...so bug her! And a HUGE YIPPEE!!! I'm sooooooooo excited & HAPPY! It's going GREAT...why change a thing?? It's PERFECT now that we have easy to cut...grungePAPER! Gotta pack up art supplies for Hannah's in Antioch, Illinois. These guys will be perfect for our planned REDO of the main bathroom. I already have the curtains...black & tan checked...cute! And who doesn't LOVE drawers?? For me...organizing is almost as much fun as creating! It now resides in the studio. ...have you every heard of the "old house society"? A gal in one of my classes told me about it & thought I just might like it. but I saw that he was just as excited! It makes me want to build another house!! TONS of vintage wood flooring & SOOOOOOOO much more. My understanding is that the society is nation wide...if you like cool old STUFF...check it out! Don't touch that channel...stay tuned! It's a 2 page spread! 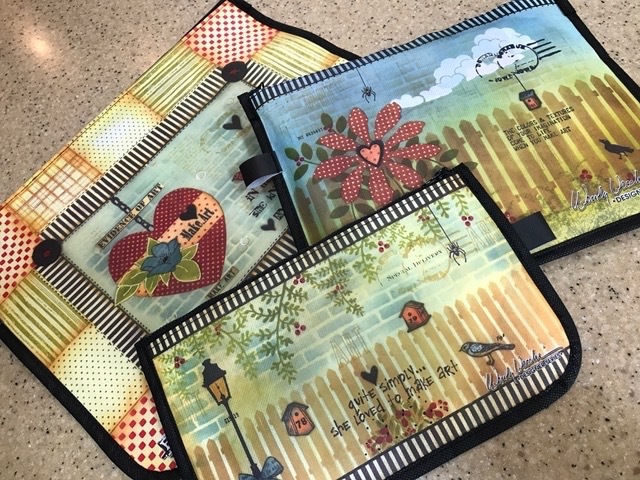 INTRODUCTION: The month we chatted to American stamper Wendy Vecchi, the talented designer behind the gorgeous Studio 490 collection for Stampers Anonymous and also a member of the Maya Road and Tim Holtz Idea-ology Design Teams. 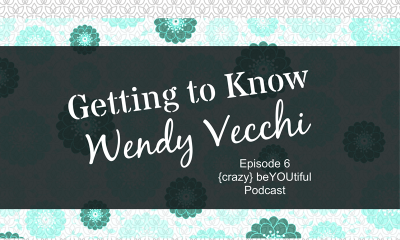 I'm Wendy Vecchi and I live in Oglesby, Illinois. I've been married to my high school sweetheart for almost 37 years. We live in the country with our horses & cats, on a farm that we call Green Acres. How did you become interested in stamping? 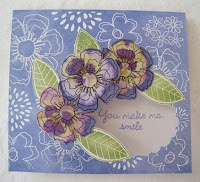 I attended a craft show with a friend and saw a demo using embossing powder. As soon as I saw the image raise, I knew I was hooked. I remember telling my hubby that this new hobby would save us lots of money, since we wouldn't need to buy greeting cards. That didn't turn out to be exactly true! But...I honestly believed it at the time! What is it you most love about your hobby? My studio is my most favourite place in all the world. 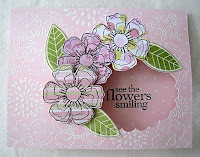 I love stamping because the possibilities are endless and I'm always excited to see where each piece leads me. I find that each stamped piece seems to take on its own personality and I'm never quite sure how it will look in the end. I love the process of creating just as much as I love the end result and I enjoy moving art parts around until they look just right. If my fingers are inky, then I've had a great day! What other arts or crafts do you enjoy? I love the art of shopping - for art parts. It's such a thrill to find something in an antique mall or flea market that fits my style. These shopping excursions are also very inspiring. I like thinking about where an item came from & about what it could be. 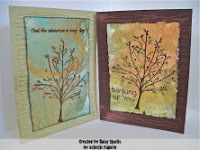 Tim Holtz Idea-ology design team. I was invited by Tim to be the guest instructor for Artful Voyage in Mexico, this October, making art and cruising with Tim! 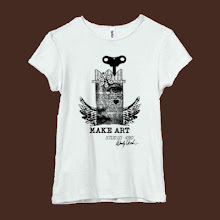 Guaranteed to be fun and an artful adventure. This is one of my most favorite creations and I actually used no paper for this project. 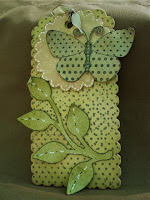 The base is a Grungeboard book and all the embellishments were custom made by stamping on Grungeboard and Grungepaper. 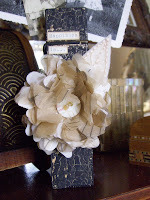 Here’s a close up of the Studio 490 grunge flower. I love the dimension. My favourite technique these days is to stamp (Studio 490 stamps of course!) 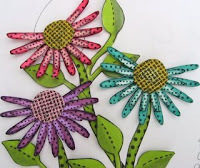 flowers onto Grungeboard and Grungepaper and to design flowers. I guess my style is vintage, but with a feminine look. I strive to make things look old, worn and well loved, which explains the muted colour palette I prefer. This is a book that I created for the Maya Road booth at CHA. It’s entitled ‘A Few of my Favorite Things’. 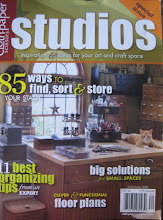 At the top of my favorite things list is my studio - Studio 490. I'm actually living a fairy tale and many days I pinch myself to make sure this is all really happening! Here's the story of Studio 490...In September of 2007, I drove two hours to a stamp store, because they were having a Stamper's Anonymous truck sale. Ted & Michelle Cutts, who own Stampers Anonymous, actually drove the semi across the country and it was full of stamps! Michelle noticed my art, she showed Ted and we visited for three hours. Next, I was accepted into Ranger U, and met Tim Holtz. We became friends; I made samples for the Stampers Anonymous booth for CHA2008 using his stamps. On the last day of CHA, Ted & Michelle asked if I would like to design stamps. I actually almost fainted and initially said no. I really didn't think that I had the ability. We talked a bit & I said that I'd give it a try. Studio 490 stamps made their debut just a few months later. I was thrilled that they were so well received. Set three is in the works for release in Orlando this July. So right now, there are 14 sets, with more coming soon. Now, the moral of this story is dreams really do come true. I'm living proof. And the best part is to be working with such wonderful friends. See? I told you it was a fairy tale! This is a favorite spread. Again, this spread uses only inks and stamps on chipboard and Grungepaper - I really love to combine these two products to make my art multilayered and dimensional. I like the designs and the sturdiness of chipboard for stamping and I like the grunge because it can be molded into shapes. It's the perfect combo. I love the colours in this piece and the saying is a favourite. I was lucky enough to be invited to Tim's Holiday Hideaway last December. I loved the project, where we altered a bird, and embellished it with vintage metal findings. 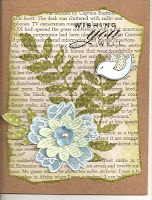 This bird was inspired by that project, but I changed it, to include stamped Grungepaper wings, tail and a funky bonnet. The mini glasses were the finishing touch. This is another altered bird, also inspired by Tim's Holiday Hideaway. To see Wendy’s Studio 490 stamp designs and examples of artwork created with her stamps, visit www.stampersanonymous.com. Studio 490 stamps are available in the UK from The Stamp Attic. 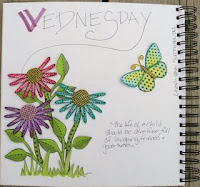 Check out Wendy’s personal blog at www.studio490art.blogspot.com for more of her inspirational artwork. THANK YOU KATY FOX...It looks great & it was a pleasure working with you. a 12 month subscription is $86. I called 1-217-355-2970...if you're interested. 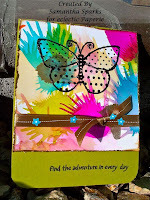 I LOVED her choice of studio 490 stamps! Thanks for sharing LYNNE!! I LOVE IT! check it out....then go shopping @ eP! Hey...it's NOT my fault! Blame Daisy!! YIKES!! I guess you guys like birds too! Believe me...they are really a FUN project! You can't make just one! did you know that just a few drops of the blending solution on a paper towel will quickly & easily clean your acrylic stamp blocks? I wanted a small container for traveling, for my eyeglass cleaner. I found that the mini mister is just PERFECT!! I put a tiny red dot on it, so that I could see it without my glasses. PERFECT! I was amazed...but everyone in the class already knew it. I hope he buys lunch! ps...I hope your weekend is sunny, fun & full of ART! Thanks to everyone for the comments about the birds...from yesterday's post. This guy is cool...but the price tag is $648.00! In my opinion...the birds from the workshop are worth much more! guess what's coming in JULY??? I left my heart in San Fr ...BUFFALO!